When it comes to boyfriend jeans I love playing around with contrasts. By adding a pair of high heels, a bright lip and some fun jewelry you get that perfect mix of feminine/masculine which I personally love. Not gonna lie though, wearing jeans in the middle of this crazy heat wave was a bit of a challenge, but I survived! SUNGLASSES Céline. 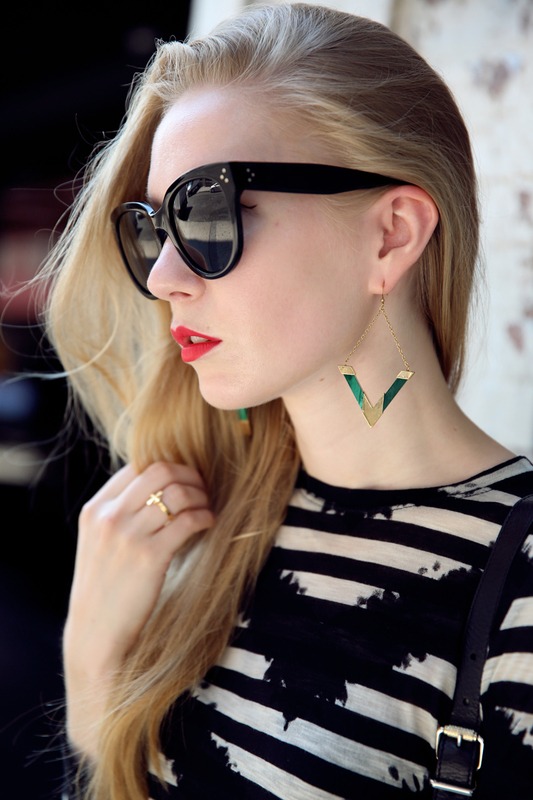 EARRINGS c/o Kelly Wearstler. TOP Proenza Schouler (similar one here). BAG Proenza Schouler ps11. JEANS Zara. WATCH Nixon (here & here). CUFF + BRACELET Fashionsquad x Cooee (here). HEELS Sigerson Morrison ‘Brielle’ (on sale here and here). oh I love the mix of boyfriend jeans and heels. your heels are killing it. amazing! Those jeans fit you perfectly! I bet they’d look great cuffed at the bottom as well! Boyfriends jeans look wonderful on you and you combine them really well! I have this look, but i wearing it with flats shoes. I love boyfriend jeans, they´re soo comfy! Those shoes! They’re gorgeous! gimme gimme gimme. Great match! Love the whole outfit! Amazing look! Love its simplicity and at the same time it look really sophisticated! I guess it’s because of the shoes! They are so stunning! Don’t miss today my Comfy and Casual look….with amazing Cow pattern!!!. Love this look! Especially yous shoes and bag! This look is so stylish! Love jeans and tee! I always find boyfriend jeans to be too baggy on me, but yours look just right! Love the classic stripes, too. I love boyfriend jeans! They look great when the look is made more feminine, especially with the red lip! love all the accesories, the shoes and the bag! great outfit choice! Such a gorgeous, relaxed look. The jeans really suit you. Love the all look! The jeans is fantastic! Love all these casual items together, the heels are perfect to finish your look! Perfect mix of chic and casual! The heels are amazing! Boyfriend jeans look great. These are perfect! I do love my boyfriend jeans! But i have to find a par of high heeled strappy sandals to pair them with, I only own chunky heels and for me a pair of strappy sandals would look better and more feminine! The most gorgeous pair of boyfriends jeans I have seen in a very long time. They fit you immensely well! Love the shoes and jeans. Very cute! Love your accessories and your jumper! Love the look, amazing as always. You’re skin looks immaculate! You’re amazing! You know hoy to make a “boyfriend jeans outfit” look so girly! Love the outfit, but the lipstick totally pulls it together! What is it? You look stunning! love those heels! L O V E That top! It looks amazing, infact loving the entire look! I LOVE THE BLACK DETAILS! Such gorgeous shots. I’m still getting over those earrings! love this outfit! the S.Morrison shoes are just great! nice look! Love the heels! We love the outfit! Especially the earrings are amazing! now these are some WAWAWOOM heels!! estas realmente fantastica! muy guapa! Great jeans. Chic alternative to the oh-so-common skinny jean/legging. Loving everything about this outfit!! Amazing! I love your blog! I really really like your style. Love the jeans and the earrings! Simply gorgeous. You look gorgeous! 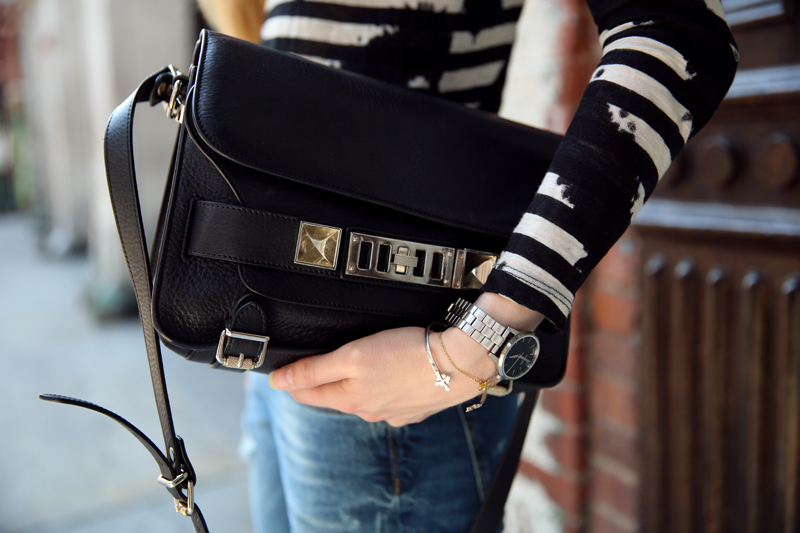 those boyfriend jeans are perfect with the proenza schouler bag! Beautiful outfit! :) love your earrings! Love this look, gorgeous! The way you styled this is perfect! Love this look, elegant but with an edge at the same time! You look amazing!!!! I love it! Love this outfit such a relax yet chic look! especially love that handbag! the jeans looks awesome on you!! love your style, you look gorgeous!! Your shoes are awesome!! Great look. Love the sweater & heels! You look so beautiful, dress suits you.